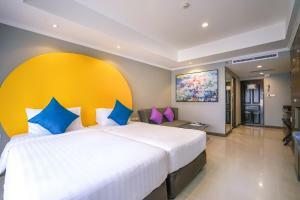 FuramaXclusive Sukhumvit is a 10-minute walk from Phloen Chit BTS Skytrain Station in Bangkok. Featuring an outdoor pool and a restaurant, it offers spacious rooms with kitchenettes and free internet. Rooms at the Sukhumvit FuramaXclusive come equipped with satellite TV, tea/coffee making facilities and a minibar. A microwave oven and kitchen utensils are provided. Guests can sunbathe by the pool or relax in the sauna. A fitness room lets guests enjoy an energetic workout. Free private parking is available. Traditional Thai dishes featuring fresh organic ingredients are prepared by Chef at La Cuisine Restaurant. Outdoor dining and room service are also available. FuramaXclusive Sukhumvit is 500 metres from the Nana Market. It is located opposite the Bamrungrad International Hospital. Air-conditioned room features a 29-inch TV, well-equipped kitchenette and sofa seating area. Bathrobes and a hairdryer are provided. Offering additional living space, this large air-conditioned room features a 29-inch TV, well-equipped kitchenette and sofa seating area. Bathrobes and a hairdryer are provided. Fitted with a balcony, air-conditioned room features satellite TV, fridge and minibar. Free toiletries and bathtub are provided in an en suite bathroom. Rate: THB 1784.00 ... THB 2945.00; select dates below to get current rates.